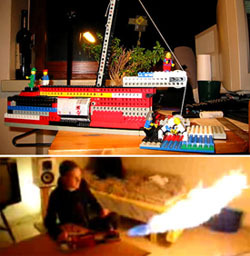 This deathtoy is built complete from Lego bricks, except for a "piece of string" and refill bottle of butane. And you thought Legos were just a choking hazard. When the Gizmodo staff goes postal, this will definitely be our weapon of choice. Hit the jump for 7 seconds of the sweetest video you've ever seen...today...unless you may have seen something better this morning...in which case you've had a pretty good day.